The Solaris Editors' Blog: The 0.01% have decided Earth is history - this is Guy Haley's CRASH! The 0.01% have decided Earth is history - this is Guy Haley's CRASH! Unalloyed greed, markets dictating the will of humanity – when the Crash comes, survival itself will hang in the balance. In a topical science-fiction take on the world’s economic woes, breakthrough author Guy Haley envisages a society in utter thrall to commerce, which must constantly expand to sustain itself. When a mission to the stars begins to go wrong, the fragility of human society and progress is exposed. The Market rules all and mankind, trapped by a rigid hierarchy of wealth, bends to its whim. A bold venture to the stars is begun, but when the colony fleet is sabotaged a small group finds itself marooned upon a world where one hemisphere is bathed in perpetual daylight, the other hidden by eternal night. Isolated and beset, the stricken colony members must fight for survival on the hostile planet. Haley’s first book for Solaris, Champion of Mars, was described by SF legend Stephen Baxter as “a novel with an ambition on the scale of Olympus Mons itself, and it delivers. 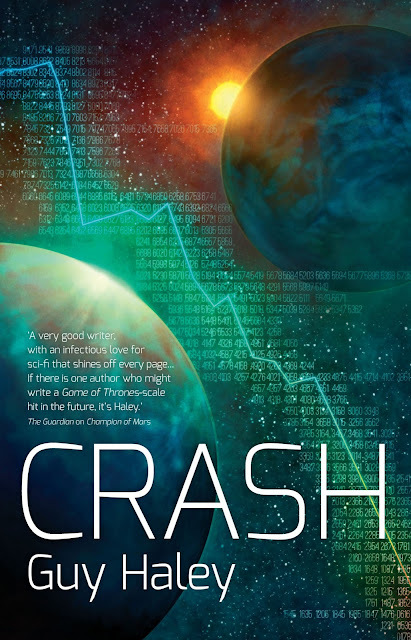 Recommended.” Packed full of ideas while maintaining a very human voice, Crash is complex, exciting, vastly entertaining and with a topical edge.